From the Chorley Conservatives' website: "In a letter delivered today, Chorley Conservatives members have learnt that Alf Doran has decided to step down as the Conservative’s Parliamentary Candidate for Chorley on health grounds. He was selected by local Conservatives in July last year. Alf Doran had to retire from the Police service having been involved in a motorcycle accident in the early 1990’s; from this further medical attention is now required. Because of the unpredictability of the timing of the future treatment with extended convalescence, Alf has considered that his treatment would harm the prospects of an effective election campaign here in Chorley." Mr Doran beat Gregor MacGregor, Thelma Matuk and Mary Robinson in July 2007. Three local councillors were rapidly shortlisted without the seat being opened up for wider applications. There will be a leaflet blitz tomorrow following the selection. 8.55pm: Cllr Dr John Howell was selected. John Howell has been selected by the Henley Conservative Association to fight the coming by-election. “Thank you very much for coming tonight. First of all let me say what an honour it is to have been selected as the Conservative candidate for the Henley constituency. “For now I just want to say that it is a huge privilege to have been selected as the Conservative candidate for my home constituency. I plan to spend the next few weeks talking to as many local people as possible about the issues that affect us all in South Oxfordshire. This Saturday - 31st May - there is a plan to deliver to the entire constituency of Henley in a day. Both campaign centres will be open and ready to receive volunteers from 0930 on Saturday morning. Both offices are close to the M40. "This is the most marginal seat in the country - it needs just a 0.2 per cent swing to go to the Conservatives. I would have been confident of a change in party whatever happened, but Rudi would have been a worthy opponent. Labour now has no chance of winning Finchley and Golders Green. I am a local candidate and we also have a deeply unpopular government and a deeply flawed Prime Minister. Glenda Jackson ought to retire gracefully now too." ConservativeHome's ChickenWatch also hears that Chris Pincher's opponent in Tamworth - Brian Jenkins - will be stepping down soon, too. Please contact us if hear of other resignations. On CentreRight.com yesterday Mark Field MP penned a defence of supermarkets but many Conservatives worry at their impact on smaller shops. According to Telegraph.co.uk, "London is estimated to have lost more than 7,000 small shops because of supermarket competition, high rents and parking fees." David Cameron has strongly supported the London Evening Standard's Save Our Small Shops campaign. ConservativeHome covered Zac Goldsmith's campaign against the decision of Sainsbury's to locate a store in White Hart Lane, Barnes. The ballot organised by Mr Goldsmith went strongly against Sainsbury's but thanks to national planning authorities Sainsbury's is going ahead with its new store. "What Sainsbury's has done is totally unethical. It has misled us, wasted our time and put two fingers up at the community... This is yet another example of a big multiple using perverse planning laws to force itself on an unwilling community... This is a local issue, but it's also national. We have bent over backwards to make it easier for them to back off. Now we will take this as far as we need to." He has now called for the "most successful ever boycott" against Sainsbury's. David Cameron met with leading members of Henley Conservatives earlier today and agreed a fast process to select a candidate to succeed Boris Johnson as the local MP. Local Tories will choose from a shortlist of three local councillors in the next week and the by-election may be held on 26th June. The leader of South Oxfordshire Council, Cllr Ann Ducker, is a strong favourite to be adopted. Tory tacticians believe that a local woman councillor plus a quick contest represent the best way of defeating the non-local male candidate recently chosen by the Liberal Democrats. With apologies for the grainy image but a bakers in Nantwich (the most Tory part of C&N) has been holding a straw poll on voting intentions. 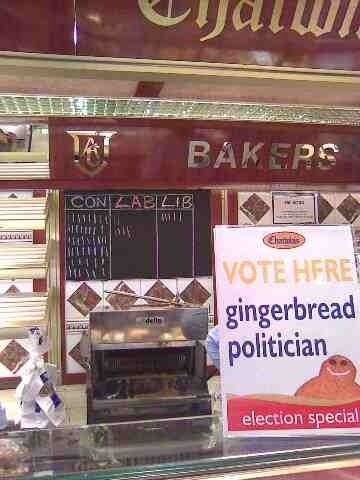 And based on the purchase of Tory, Labour and LibDem gingerbread men it's looking good for the Conservatives! The blackboard looks about 50 Tory gingerbread men, 6 Labour and 5 LibDems. Britain's pollsters will be worried at this new innovation. Owen Paterson MP is also hopeful for a good turnout from the area of Crewe that he was leafletting from 3.45am to 8.15am this morning. His patch included Cameron Avenue, Osbourne Grove and Ashcroft Avenue. And just so Nantwich doesn't feel left out... GORDON BROWN IS DEAD NAN TWITCHING (Andrew Lilico). See the graphic below to note that both NO2ID and the TaxPayers' Alliance advertised online during the campaign. The TPA urged people to vote for lower taxes and NO2ID quoted Gwyneth Dunwood's concerns about ID cards. You'll note that the LibDems' Elizabeth Shenton is also e-vertising. And finally... Benjamin Gray has captured this photo of Nick Clegg campaigning in Crewe. Mr Clegg's expression doesn't exactly match the Winning Here placard! Liveblog from 10.30pm tonight as we await this historic by-election result. Expected at about 3am tomorrow. The Conservative team in Crewe and Nantwich are reporting that volunteer numbers for the C&N by-election have broken all records but that there is still work to do. If you can help in any way in these final 24 hours please email [email protected]. Betting on a Tory victory may have closed but Ladbrokes are speculating as to whether Labour might come third. Tories are dismissing this idea and saying that only a vote for Edward Timpson can send Gordon Brown the message he needs to hear. Journalists are already hearing excuses from inside the Labour camp in Crewe and Nantwich. Guess who they are blaming for the expected poor result? Yep: one James Gordon Brown. The local elections count in C&N on 1st May was slow and we're expecting it to be slow again. Don't expect a result until 3am on Friday morning. We'll be up, live blogging. Stay up with us! Please email if you can help moderate the live chatroom we're planning. A rumour for you: There is gossip in the Westminster village that Mark Oaten may be about to quit his Winchester seat for a job in the USA. It's unconfirmed but a by-election in Hampshire would be very useful for our defence of Henley if the LibDems are forced to fight on two fronts. The LibDems are already mass surveying Henley. Boris is reportedly keen to quit the seat early and attempted to force the issue on some reluctant party high-ups by writing a farewell letter to his constituents via the Henley Standard. PoliticsHome are offering a £500 prize for the person who most accurately predicts the winner of the Crewe and Nantwich by-election. Click here to take part. Labrokes, incidentally, have suspended betting on the race. A spokesman said: "If the Parties were boxers they wouldn't be allowed in the same ring at the moment. It is so uncompetitive that politics punters have given up." 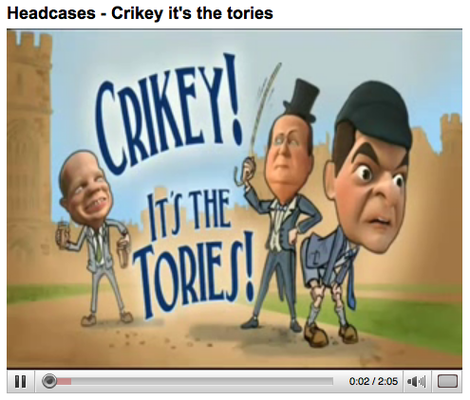 PS Just a thought but did ITV's Headcases provide inspiration for Labour's C&N campaign? ICM put the Tories 8% ahead in its poll for Sunday's News of the World. A poll by ComRes for today's Independent puts the Tories 13% ahead. The Conservatives are on 48% and Labour are on 35%. The poll confirms that C&N is a two horse race; the LibDems are on just 12%. 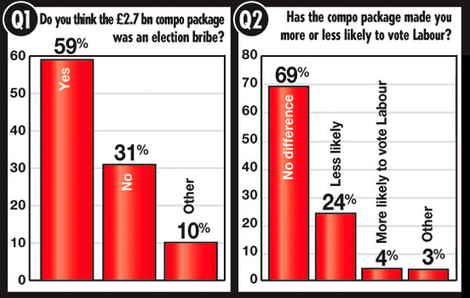 The poll comes as the Tories highlight concern at more dirty tricks - possibly coming from Labour activists. According to The Telegraph, there is concern that "Labour activists have been posing as Tories and calling voters at 4am. They are said to have told residents that Tories have been campaigning in Bentley cars." Posted below are the some more images from the campaign trail, the bottom two taken by Michael Fabricant MP who is coordinating the involvement of MPs, Peers and MEPs. This seat certainly appears like a two-horse race. No evidence of LibDem activity. Lots of Labour to Tory switchers. Switchers are citing a dislike for Brown as much as the 10p issue. Voters are volunteering their unhappiness at Labour's toffs campaign. Stephan Shakespeare wrote earlier about Labour "weapons testing" in Crewe. On today's evidence the weapons are only going to injure their creators. Not sure of the effectiveness of Labour's Alex Ferguson poster. Not everyone supports MU! One Arsenal supporter was very unhappy about it. One person told one of our team that they were definitely voting for "Tamsin Outhwaite"! Real evidence that voters have had enough of this campaign. They've been 'Iowa'ed' with masses of leaflets, rings of the doobell and phone calls. The quality of the Tory literature is the best the ConHome coach party have ever seen from our party but it's close to being too much of a good thing. Hat-tip to Islington Tories for providing 5 members of our party of 47. (Promised them we'd mention that). This seat is definitely winnable because of the A1 operation being run by Stephen Gilbert and Eric Pickles. We'll know on Friday morning if it was enough. Boris will be pleased that no alcohol was consumed on the homeward journey. 1.36pm: All activists are now on the campaign trail - delivering leaflets or canvassing. No stopping for lunch. We all ate on the coach. Our base camp is a pub which is displaying posters for all three main parties. Some disappointment here that that doesn't include posters of Miss Great Britain. Pasted below is a selection of Labour's Crewe literature as discovered on the 'By-Elections Blogspot'. The Tory lead in the seat is 8% according to the same poll. Are you proud of this, Mr Brown? Hat-tip to commenter andy s.
The greed of New Labour: "Thanks to the recent publication of memoirs by John Prescott, Cherie Blair and Lord Levy, it is becoming obvious to everyone the extent to which New Labour has been driven by private greed and personal vendetta, rather than decency and public duty. To underline this point, it was revealed last week that the Blairs have purchased their seventh home - a £4million mansion in Buckinghamshire. The truth is that Tony and Cherie Blair can afford their growing property portfolio purely because they have both ruthlessly exploited the office of prime minister for purposes of self-enrichment." The mudthrowing Ken Livingstone: "The campaign to keep Ken Livingstone in office as London mayor, as I have repeatedly highlighted in this column, was dominated by systematic lying and blatant corruption, as well as by the use of unfair personal attacks on his Conservative rival Boris Johnson". Class war in Crewe and Nantwich: "Labour has cynically decided not to fight on policy issues. Instead, party bosses have ordered a series of cheap and shoddy attacks on the Conservative candidate Edward Timpson. For example, fake photographs are being distributed of him wearing a top hat. Labour campaign literature also contains pictures of what is described as his 'big mansion house' just outside the constituency. This is nothing more than malicious class war." 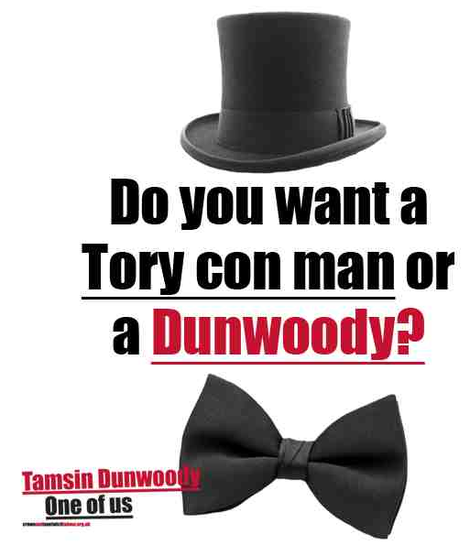 Labour's race-based campaign in Crewe: "Dunwoody is circulating a 'Tory candidate application form' around Nantwich. It asks: "Do you oppose making foreign nationals carry an ID card?" Actually, as Dunwoody well knows, the Tories are opposed to ID cards for all citizens, and not just for foreigners. As such, Labour is spotlighting this one very narrow aspect about foreigners in order to press the racist button with voters." Brown is responsible for this: "All the evidence shows that Labour's disgusting electioneering methods come from the very top. Last September, I listened in shock as Gordon Brown utilised the language of the British National Party to promise 'British jobs for British workers' in his first speech as Labour leader at his party conference." "All public figures make such slips. It matters more when a visiting dignitary - preferably a US president - gets the name of a small country wrong live on national TV. No chance of a retake there. What was interesting was Cameron's own response. As I recall it he raised his hands in mock-horror, turned around without pausing and stuck his head in the nearest bush. I thought it was funny, both self-deprecating and self-confident, a Monty Python-inspired moment. We like our politicians to be human (not too human, mind you), and most try to be, albeit with varying success. I thought this was a glimpse of how Dave must be with his kids and thought the better of him for it." So, even if we don't win C&N, the Pythonesque-Cameron has at least won the affection of a Guardian journalist. PS Iain Dale is just back from Crewe and has written a list of observations including "I didn't see a single LibDem or Labour campaigner on the streets in the entire time I was there." Our campaign team in Crewe and Nantwich is telling us that Labour are "hiding" their leaflets from journalists! Reporters are repeatedly asking our campaign team for copies of Labour leaflets. Labour are, it seems, very aware that their class-based campaigning is going down like a lead balloon. They are also hiding Tamsin Dunwoody from TV journalists to avoid any more interviews like this. Pasted below are the front and back pages of a new leaflet being distributed by the Conservatives. A large newspaper - entitled 'Change' - is also being distributed. We hope to publish extracts of that later, or tomorrow. PS Sunday's ConservativeHome 48 seater coach is fully-booked. If you still want to help but can't physically get to C&N please email [email protected] and volunteer to do some telephone canvassing. It's becoming increasingly clear that the Liberal Democrats have more or less abandoned Crewe and Nantwich. They are still working a couple of wards according to Tory sources so they achieve a respectable result but they know that only the Conservatives or Labour can win the seat. This is obviously good news for the campaign in Crewe but we must get on with selecting our candidate in Henley. Henley isn't included in the new tranche of selecting seats - just released. Why are we waiting? The LibDems have just adopted their candidate. We shouldn't be giving him the opportunity to make inroads. "When I canvassed in Crewe for Patrick Rock in the 1980s, as an eager beaver, it was somewhat disheartening to be told to f*** off by staunch Labour supporters. It was quite extraordinary last night to meet Labour voters who are openly switching. A 40 year old woman told me: "My family have been trade unionists and Labour for 100 years - my Granny would turn in her grave but we're voting Conservative this time." A 35 year old man told me: "I've voted Labour all my life but they can stick it this time." Alternatively, they are clearly stating that they are undecided but are reading our literature and admitting that they like what they read about our candidate. It must be unprecedented that busy, hard working people are spending so much time reading our leaflets so carefully when in so many other elections I have helped with, they have put them straight in the bin. In the brand new estates where I picked up the quotes last night, the Labour toff attack is backfiring miserably, the attitude being that "If Edward Timpson has made a success of his life then good for him - that's what it's all about." Labour are also losing support by telephone canvassing with real aggression. I am genuinely looking forward to getting back as soon as possible after Northern Ireland Questions. Crewe and Nantwich has always been known locally as a Labour seat but I have never had such a reception as I had last night." "The closing date for these applications is midday on Friday 30th May. Only applications on the standard CV template (attached to this email) will be accepted. Please only use this template. Once complete, TWO signed copies of the standard CV template should be sent to Gareth Fox at The Candidates Team, CCHQ, 30 Millbank, London SW1P 4DP. You must comply with this. The CV should run to no more than 2 pages plus the 1 page cover sheet. Any CVs submitted that do not meet this criteria will not be accepted. These pages must be stapled. Please do not include photographs on your CVs. Emailed CVs are not acceptable, they must be hard copies." It's not as bad as the "excellance for all" that recently appeared on one Labour site. "We expect those candidates to help unless you have some compelling excuse. We are keeping a record of who helps and how much, so make sure you stay in our good books!" One candidate who has been active in Crewe described the email as "clumsy bullying". 37 people have now pledged to come on the ConservativeHome London to Crewe coach. There's still room for more! If you cannot make it to Crewe & Nantwich in person, you can help out either at the CCHQ call centre or by making calls from home. To confirm, please send an e-mail to [email protected] with “call centre” or “home calls” in the subject line. Posted below is a latest Tory leaflet. The two-sided communication targets the bread and butter issues of tax and living costs. Click on the images to enlarge them. "My wife Dulcie was a qualified secretary when I met her in 1968. For 30 years, during my time as an MP, Minister and MEP, she has been my full-time secretary, paid the market rate. This has always been openly declared and well-known. She has also been active in the community for many years, as is the case with many thousands of local councillors who give of their time, over and above their normal working environment. Dulcie is no different, except perhaps that she works during too much of her “leisure” time! My son worked full-time in Brussels for a period after leaving University and was paid at the same – if not slightly lower rate – as other Parliamentary assistants of his age and experience. He was head-hunted away on a much higher salary and ceased working for me in 2004. These employments were legally contracted and registered with the Parliamentary authorities, who have approved and audited them each year." "The class warfare stuff, although cheap, is bording just about acceptable; but one thing horrified me (on an election leaflet): "Do you oppose making foreign nationals carry and ID card?" Regardless of the fact that I oppose ID cards in anyway, shape or form (the mere idea is distinctly alien to Britain) - "making", "foreign nationals" is the language of the [far] right." Simon Chapman used a post on CentreRight to note Labour's playing of the race card. Saturday's Daily Mail highlighted Labour's class war attacks on David Cameron and Edward Timpson. ...But don't just blog - do something!! ICM puts us 4% ahead in Crewe but only a lot of work will guarantee victory. At the time of posting this there are 27 people signed up to join the ConservativeHome coach trip from London to Crewe this coming Sunday, 18th May although a good number of others are making their way to the by-election from other parts of the country. It would be great to get closer to 40 for the coach. We'll be leaving Westminster at about 9am on Sunday. Please email us if you'd like to come along and contribute to what we hope will be the first Tory by-election gain for 26 years. Both the News of the World and the Independent on Sunday spotlight MEPs today - particularly Tory MEPs - and the benefits they receive for being parliamentarians. "Tory toff North West MEP Sir Robert Atkins, pictured above, has admitted paying his pensioner wife Lady Dulcie Mary Atkins, also pictured above, over £30,000 a year as his secretary. She squeezes this role in alongside her work as a busy member of Wyre Borough Council, and Garstang Town Council, as well as holding down a string of community and charitable commitments. But Sir Robert is generous with public funds—our records show that back in 2002 HIS SON James was also on the payroll at £2,513.23 a month." Asked to explain these payments, Sir Robert Atkins told the News of the World: "It's very complicated and I don't suppose any of your readers would understand it." We're happy to give this page to Sir Robert to provide an explanation of this use of taxpayers' money. We'll print what he sends us in full, unedited. "South West MEP Giles Chichester, has now admitted paying his wife Virginia up to £30,000 as a PART-TIME assistant. He is also paying up to £30,000 of taxpayers' cash to his family firm Francis Chichester Ltd which publishes maps and guide books. He claims that the company provides him with secretarial help." The Sunday Times had spotlighted Mr Chichester and Den Dover MEP in March. "[Malcolm Harbour] is a leading figure in the debate on carbon dioxide and fuel efficiency in Brussels. Since 2004, Mr Harbour has been loaned 18 cars by the industry. Also courtesy of the car industry, he has attended Grand Prix races and received cross-country driving instruction. Provided they declare any interest, MEPs are not breaking any regulations. Mr Harbour says he drives cars because he needs "to understand what is going on, and I declare it as I feel that I have nothing to hide"." "Giles Chichester, Tory leader in the parliament, is also president of the European Energy Forum, which promotes the interests of the oil, gas and nuclear industries. In May 2007, he was the guest of nuclear company Areva at the America's Cup race off Valencia. Mr Chichester says the trip had no bearing on his long-held pro-nuclear views." David Cameron recently won a battle with MEPs to force them to disclose more about their pay and expenses. But, given today's revelations, a commitment to transparency may not be enough. Certain practices may need to be outlawed. > News of the World video here. Meet Edward Timpson... the next Conservative MP for Crewe and Nantwich? With your help he could be. ConservativeHome is organising a coach next Sunday (18th) from London to Crewe. We've got about twenty people who have said 'yes' so far to joining us. Please click here for information about coming along too. We know that there is going to be a by-election for Boris Johnson's Henley seat. David Cameron confirmed as much during his press conference on Tuesday. The party is understandably focused on the Crewe campaign - as are we - but let's not delay for long. We don't want the LibDems building up a head of steam. Let's select a local person and let's select that person quickly. Fancy a coach trip to Crewe and Nantwich? Please email us if you're available on Sunday 18th May to travel with fellow ConservativeHome readers from London up to Crewe for a day of campaigning. We are planning on hiring a coach - ideally with wireless! PS The Tory website for the campaign is here. In ConservativeHome's end-April survey of the Tory grassroots we asked party members to rate the importance of various characteristics when it comes to the selection of Conservative candidates for parliamentary seats. The graphic on the right summarises the results. Knowledge of the particular area. If yellow stronghold then knowledge of them important. Proof they are actually Conservative and not just a careerist jumping on the Conservaitive party Bandwagon to further their own careers through a political medium. A successful life outside politics! Willingness to work and lead instead of talk! Must be prepared to do what is best for their constituency above political ideolgy or party loyalty. Evidence of achievement outside politics, eg running a successful business, charity work, overcoming a big disadvantage or challenge in life. Must be capable of original thinking, not just a clone. Sadly, ability to look/sound good on TV. The ability to form a strong, loyal, and enthusiastic group of workers around them. Aptitude for holding executive to account, not just as potential Minister. Prepared to be seen about the constituency on a very regular basis. Ability to relate to people at all social levels. A hunger for candidates from outside of politics was noticeable. Westminster village candidates beware!